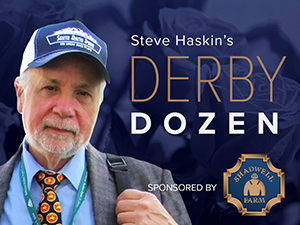 Be sure to read the first official Derby Dozen in Blood-Horse magazine next week! The Holy Bull should tell us if his stay at No. 1 will be short-lived or not. This is going to be an early reality crusher for several of them, having to face undefeated Mohaymen and another Top 12-ranked horse Conquest Big E, as well as other talented colts with promise. A victory is not necessary by any means, as he’s not exactly tearing up the track in the morning. He just needs to be coming at the end over a track that normally is conducive to speed and show he’s moving in the right direction. If he flunks his test, at least we won’t be investing too much time with him on top, and we can move on quickly. He’s listed as a probable, but if he doesn’t show up, then we have to take a different mindset altogether. He’s far from firmly entrenched in the top spot, so we need to take a positive away from the race to keep him there. He’s following the Street Sense path to the Derby – the Tampa Bay Derby and Blue Grass Stakes. That should be sufficient to get him to the Derby fit, as he has a pretty good 2-year-old foundation under him. He’s in a virtual dead-heat for the top spot, and has Derby horse written all over him. But for now, we can only just sit on him until he shows up in mid-March. He’s a powerful closer with an excellent turn of foot, and I love the way he stormed past a top-class horse in Exaggerator in the Breeders’ Futurity. Can’t fault his fast-closing third in BC Juvenile, in which he was hurt by the short stretch run. Surprised to see him show up on the work tab after 3 months with a :47 4/5 breeze, so he’s already sharp. He followed that up with a solid 5f breeze in 1:01. He could very well jump into the top spot if he wins the Holy Bull Stakes impressively, but it all depends on how fast Greenpointcrusader is coming at the end. If he runs to his works (5f in :59 2/5 breezing last Friday), everyone could be running for second. If someone had told Kiaran McLaughlin after the 2014 Holy Bull that the next Triple Crown sweep not only was imminent but the horse that will sweep it will have an Egyptian-themed name, you can be sure he would have envisioned himself in the history books, considering he had just won the Holy Bull by nearly six lengths with a horse named Cairo Prince. But that would have been a nasty tease, as Cairo Prince would finish fourth in the Florida Derby as the 6-5 favorite and never race again, while American Pharoah showed up two years later to march into history. And who was the immediate victim of American Pharoah in his Belmont Stakes victory? Runner-up Frosted, trained by Kiaran McLaughlin. Come on, tell me the Derby gods aren’t on top of this. Worked 6f in a tepid 1:15 3/5 for scheduled debut in the 7f San Vicente Stakes, where he’ll tangle with the top-class Exaggerator. Hard to find faults in an undefeated 2-year-old champion and winner of the Breeders’ Cup Juvenile and two other grade I stakes. Should get 1 1/8 miles, but not sure how effective he’ll be at 1 1/4 miles, especially with only a 7-furlong and 1 1/8-mile race scheduled before the Kentucky Derby. His female family does trace to a number of class/stamina influences, such as Pleasant Colony, Seeking the Gold, Buckpasser, Arts and Letters, and Cox’s Ridge, so question marks surrounding his distance ability may not be warranted. People are going mainly by Uncle Mo and Forestry up close, but both those horses do have sufficient stamina in their pedigrees when crossed with stamina influences. Desormeaux has been concentrating on long stamina building works rather than short speed works, which looks to be a wise move as he prepares for the San Vicente. His last two works (6f in 1:13 4/5 and 7f in 1:25 4/5) should have him plenty fit for his 7f debut, indicating Desormeaux, like he did last year with Texas Red, is using the San Vicente itself as a sharpener and a first step on the Derby trail. We already know he has sprinting speed, and you don’t want him setting any records first crack out against the 2-year-old champ. The main task right now is bringing out his true talent, which I don’t believe we’ve seen yet, even with his impressive credentials. You have to admire his consistency and having already run at Santa Anita, Saratoga, Del Mar, Keeneland, and Delta Downs. He’s won graded stakes at 6 1/2 furlongs and 1 1/16 miles and has good tactical speed. Brody’s Cause caught him late in the Breeders’ Futurity and nipped him for third in the BC Juvenile. He just has to keep progressing and take that next step up to where he can defeat horses like Brody’s Cause and the other leaders of the division. Good to see him back on the work tab Monday after missing his last work with a slight temperature. He breezed his half in :48 flat, the third fastest of 70 works at the distance, so, fortunately, everything is back on schedule and this shouldn’t set him back any. He still has to prove he is as effective on a fast dirt track as he is in the slop and on the turf, but his victory in the Kentucky Jockey Club Stakes was flattered when runner-up Mor Spirit came back to win the Los Alamitos Futurty and third-place finisher Mo Tom captured the LeComte Stakes. And his pedigree does lean toward dirt. Being inbred to In Reality could very well have accounted for his big performance in the slop. The fact that he won the Kentucky Jockey Club with authority and was drawing away from very good horses at the end is extremely encouraging. He gets stamina from Colonel John, a son of Tiznow, but his broodmare sire is pure sprinting speed. The classy distance grass horse With Approval gives him more stamina in his tail-female line. Continues to to work well for possible start in the Feb. 6 Robert B. Lewis Stakes. Breezed 6f in 1:13 3/5 Saturday. Hard-knocking grinder type who keeps coming at you whether racing on the pace or back in the pack. The good news is he looked impressive coming from off the pace to defeat stablemate Toews on Ice in Los Alamitos Futurity. Bad news is that Toews on Ice tired badly next time out in the Smarty Jones Stakes, a rare poor effort from a Bob Baffert horse at Oaklawn Park. Gary Stevens seems to be very high on him and looks to be the perfect fit for a horse with his diverse running style. Eskendereya would have been a solid favorite in the 2010 Kentucky Derby before suffering an injury and looks to be a promising young stallion. If you like Mohaymen you have to rank this colt pretty high following a pair of strong seconds to the Shadwell colt in the Nashua and Remsen Stakes and then coming right back to win the Jerome Stakes impressively. He ran a big race in the Remsen, pressing the pace, with two horses, including Mohaymen, right on his tail. Mohaymen was able to slip between horses on his inside to take the lead, but he battled on to the finish in a game effort. In the Jerome he had a perfect setup, sitting in fourth with three horses battling head and head for the lead. He went by them in one fell swoop and drew off despite lugging in on his wrong lead. He did switch to his right lead inside the final sixteenth and finished with good energy. He’s run four times in less than 3 months and has already been 1 1/8 miles, so Brown might want to give him a little break and point for the Gotham and Wood Memorial. But we'll see if shows up for Saturday's Withers Stakes. Thought his allowance victory over Unexplained was going to be an important race, but following Unexplained’s dull effort in an Oaklawn allowance race I don’t know what to make of that. He’s been working sharply for the Holy Bull Stakes, so we should find out soon enough just where he belongs, as he takes on Mohaymen and Greenpointcrusader. I believe there is more to this colt than what he’s shown so far and this would be an excellent opportunity to see just what he’s made of, especially on a fast track. His tactical speed should suit Gulfstream and his last three works at Palm Meadows were strong, so there is no reason to think he won’t make his presence felt. His female family traces to the C.V. Whitney-bred Silver Spoon and the George Widener-bred Belmont Stakes winner Jaipur, so there is plenty of class on the bottom. Could it be this colt that will spoil the coming out party for Mohaymen, Greenpointcrusader, and Conquest Big E in the Holy Bull? What I love about him is the way he puts himself into the race quickly on the far turn and without any urging. He is able to make his way through all kinds of traffic, flying past horses with his rider straight up in the saddle, and then blow his opponents away in the stretch. There is no doubt he’s improving in leaps and bounds and it’s just a matter of whether he can now step way up in class and duplicate what he’s done against lesser competition. If he can’t, he will join Unexplained as a very brief addition to the Top 12. But if he can against this caliber of horses, then he likely will move way up the list and be considered a major Derby contender and a heckuva one-two punch with Brody’s Cause. I sure wouldn’t bet against Dale Romans with a pair like that. Although he runs like a horse who wants more distance, one does not associate his sire and broodmare sire with stamina. He is a half-brother to Breeders’ Cup Juvenile Fillies runner-up Beautician, who was more geared toward speed, and his dam is a half-sister to the top-class sprinter Kashatreya, although she is inbred to Nijinsky. His LeComte victory, running by everyone with a clean outside move, was a much more professional effort than his Ky. Jockey Club third-place finish, in which he jumped over to his left lead under right-hand whipping and ducked in sharply, coming precariously close to hitting the rail. The bottom line is, he runs contrary to his pedigree, so it’s difficult to assess up to what distances he will be effective. There really isn’t too much to add about him that hasn’t been said last week, as he’s strictly a guess based on his potential from a visual standpoint. His two races statistically reveal very little and I’m merely going by the eye test and what he might be capable of accomplishing stretching out to two turns against far better competition. And he is playing catch-up, with only two sprint races to his credit. But he looks to have a world of talent, and I love the way he won a 7f allowance race by 7 1/4 lengths, showing good natural speed and the ability to rate behind horses. And he possesses the turn of foot and flowing stride you want to see in a young horse. There is a good chance he will lose his place in the Top 12 as others prove their merit before he runs next in the Fountain of Youth Stakes. But I just wanted him there initially, and then we’ll see where he fits. Running in the Golden State Juvenile Stakes and Cal Cup Derby seemed like a highly unlikely path to the Kentucky Derby until California Chrome used it successfully two years ago. Well, say hello to SMOKEY IMAGE, who has already won the Golden State Juvenile and three other Cal-bred Stakes, and is undefeated in five career starts. The son of Southern Image’s performance in the Golden State was one of the most impressive I’ve seen from this crop of horses, as he overcame a bad start and a ton of traffic problems. One second he was checking on the far turn and backing out of contention and behind a wall of horses and the next he was flying along the inside and back in the hunt, eventually winning by three-quarters of a length over the Paul Reddam—Doug O’Neill horse FOUND MONEY, winner of the Santa Anita Juvenile who went on to win the King Glorious Stakes and finish fourth, beaten 3 3/4 lengths in the Sham Stakes. Despite never changing leads, Smokey Image was striding out strongly at the wire. In the I’m Smokin Stakes at Del Mar, he battled head and head on the lead through fast fractions and drew off to a 4 1/4-length score in 1:09 3/5. The Cal Cup Derby will tell us how effective he is around two turns. I’ve already had to drop one horse off the Top 12, as UNEXPLAINED ran a lackluster race in an Oaklawn allowance, finishing a non-threatening fourth behind the Jack Van Berg-trained CUTACORNER, a close fourth in the Remington Springboard Mile. The only excuse I could give him is he is missed some training due to the weather, but he again failed to change leads and that’s not a good habit for a young horse to get into. He certainly looked more promising in his debut and then finishing a fast-closing second to Conquest Big E in a Churchill allowance race. We’ll see where he goes from here. If you’re willing to throw out his fifth-place finish in the Delta Jackpot in the mud, then you might want to follow the Ron Moquett-trained WHITMORE, who has sandwiched that performance with two brilliant sprint victories, the last coming in a 6f allowance race at Oaklawn Jan. 16. As a son of Pleasantly Perfect, there is no reason to think he won’t stretch out effectively. In his maiden victory, he cruised to the lead with jockey Didiel Osorio already taking a peak behind him. He changed leads smoothly, but when he was hit with a left-handed whip as he was starting to pull away he ducked out sharply. He straightened himself out and was then hit with a right-handed whip and jumped over to his left lead. But he quickly switched back to his right lead on his own, and once the whip was put away he coasted under the wire by 7 1/4 lengths under wraps. After the Delta debacle, in which he was on the pace and tired, Moquett put blinkers on and dropped him back in a sprint and it was obvious the blinkers made a difference. Down the backside he was in heavy traffic and had to check, but continued to bide his time. Stuck behind horses, the rail opened up and he took off. Osorio hit him with a series of right-handed whips, but kept them backhanded on the saddle cloth and Whitmore continued to run straight and true, drawing off in the final furlong. He did switch over to his left lead late, but was already well clear, winning by 3 1/4 lengths. I can’t wait to see this colt stretch out again, likely in the Southwest Stakes. One horse I’ve been high on since his second in a maiden race is MR. COKER, who came back win on Jan. 18 for Jerry Hollendorfer. But he, like Unexplained, has problems changing leads. Once he matures and breaks that habit, the feeling is he could turn into a serious horse. The son of Candy Ride has plenty of distance in his pedigree, but with only two sprints, he has a lot to prove and a lot of catching up to do. Speaking of Hollendorfer, he sent of his fleet-footed I WILL SCORE for a 6f work in 1:11 3/5. The undefeated son of Roman Ruler still has to show he’s more than a sprinter, having torn up the clock in his two starts with fractions of :21 3/5 and :21 1/5 for his quarters and :44 2/5 and :43 3/5 for his halfs. He’ll have to harness that speed big-time if he has any hopes of succeeding on the Derby trail. One very interesting horse who has been turning in some sneaky good works at Palm Meadows is the Graham Motion-trained RAFTING, who was a mess in finishing third in an allowance race, in which he got very rank and dragged jockey Florent Geroux up into contention after drifting wide into the first turn, then looked awful on his wrong lead in the stretch. But in his last start, the one-mile Smooth Air Stakes, he was a totally different horse and much more professional as he drew off to a 2 1/4-length victory, although in a tardy 1:40 for the mile. Even though this was a big improvement, he still didn’t handle the first turn very well and has to work on that. He’s turned in back-to-back 6f breezes in 1:13 and 1:13 1/5 and if he takes another step forward he could make his presence felt. It was DISCREETNESS and GORDY FLORIDA who battled it out in the Smarty Jones Stakes at Oaklawn, but the horse to keep an eye on at longer distances is third-place finisher SYNCHRONY, who saved ground all the way, but ran up behind a wall of horses in the stretch and was bumped and leaned on from the outside while still stuck on his left lead. He finally found a clear path and when he switched to his right lead he showed excellent acceleration and was running strongly at the end. It’s good to see the familiar Pin Oak Stable silks on the Derby trail. A maiden winner who caught the eye at Fair Grounds last week was the Greg Foley-trained ZAPPERINI, a well-bred son of Ghostzapper with a ton of stamina in his pedigree. After closing like a rocket only to get beat a neck by Z Royal in his career debut at a mile at Churchill Downs, he came back with a gutsy maiden score at a mile and 70 yards, going 5-wide at the head of the stretch, holding off one challenge on his outside and wearing down a tenacious Virtual Machine while doing it all under a hand ride and coming in and crowding the runner-up in the final sixteenth. I like the way he moves and I like the way he passed horses so methodically on the turn without being asked. The exciting SHAGAF moved a step closer to his 3-year-old debut, breezing a half in :48 4/5 at Palm Meadows. He’s entered in a one-mile allowance race Friday against Todd Pletcher’s maiden winner RALLY CRY, who has turned in two excellent works at Palm Beach Downs, breezing 5f in 1:00 1/5 and then turning in a bullet half-mile in :48 breezing, fastest of 32 works at the distance. Another brilliant lightly raced colt, DREFONG, worked 6f in 1:13 1/5 at Santa Anita for Bob Baffert. Hopeful winner RALIS, who has been disappointing since that impressive victory, was back on the work tab, breezing a half in :50 1/5 at Santa Anita. Those looking abroad for Derby horses have to keep their eyes on the Japanese colt LANI and the Godolphin colt BLUE CREEK. Lani, a son of Tapit, out of a Sunday Silence mare, has won his last two impressively, and Blue Creek, by Street Cry, out of a Dynaformer mare, won his only start at Meydan by 5 lengths. Both colts likely will hook up in Dubai as they prepare for a run at the Kentucky Derby. An interesting horse to keep an eye on, possibly in the Fountain of Youth or Risen Star or at Tampa, is the Chad Brown-trained GIFT BOX, who demonstrated an impressive turn of foot on the far turn in the Remsen Stakes, but was unable to sustain it in the stretch, finishing third in only his third career start. He’s turned in a couple of solid half-mile breezes at Palm Meadows. He is a half-brother to Stonetastic, who was primarily a sprinter, but could stretch her speed out to some degree to 1 1/16 miles. I do like his inbreeding to Fappiano through Cryptoclearance and Unbridled, and he broke his maiden going 1 1/16 miles at Belmont, beating a promising and talented horse in MATT KING COAL, who came back to break his maiden by nearly 6 lengths going a flat mile at Belmont. Another interesting prospect, GUN RUNNER, who finished a good fourth, beaten only 3 1/4 lengths, in the Kentucky Jockey Club Stakes has been working solidly at Fair Grounds, breezing 5f in 1:01 1/5 on Jan. 19. SUNNY RIDGE, second in the Champagne and Delta Jackpot, has had some curious works at Belmont Park, breezing 5f in 1:03 2/5 and a half in :55 4/5. Will we see a battle of the Champagne and Remsen runners-up in the Withers? Jerome runner-up VORTICITY is another possibility for the Withers. AWESOME BANNER had his first breeze since winning the Hutcheson Stakes by 4 3/4 lengths in 1:09 2/5, going an easy 3f in :36 1/5 for trainer Stanley Gold. The son of Awesome of Course set a track record for 4 1/2 furlongs in his career debut, winning by 9 3/4 lengths. He’s no doubt lightning fast, but we’ll see how far he can carry that speed if they elect to stretch him out.